Three different NYPD Precinct Commanders have commended Shomrim in the past three days. King was referring to an incident early (this) Wednesday morning, when Flatbush Shomrim members patrolling in the frigid weather (24 degrees!) watched a man breaking into vehicles on Quentin Road and East 21 Street. The man ran into a building on the corner of Ocean Avenue and Quentin Road, but was taken into custody minutes later by fast responding NYPD 61 officers. The suspect had an outstanding warrant in addition to his new charge. 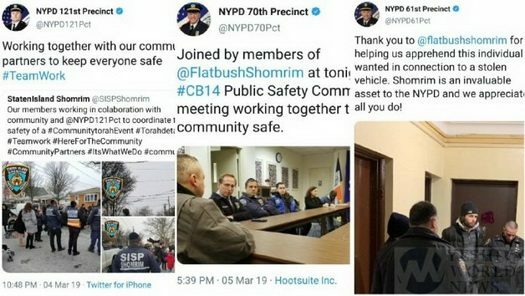 In the nearby NYPD 70 Precinct, Commander James Palumbo tweeted how he was joined by members of Shomrim at the Community Board Public Safety Committee meeting “working together to keep our community safe”. Palumbo attends these meetings to update the community of the latest crime stats. 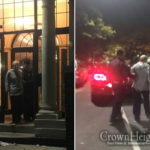 The Community Board invited Shomrim to do the same since their members are on the streets in the dead of night, assisting in making many arrests each month. Shomrim Coordinators gave a presentation to the Board about the latest crime in the area that they encountered, and suggestions for deterrence. Meanwhile in the Boro of Staten Island, NYPD 121 Precinct Commander Matthew Harrington was grateful for the assistance that Shomrim of Staten Island provided at a Hachnosas Sefer Torah this past Sunday. Shomrim around NYC respond to dozens of calls each day, and are responsible for countless arrests. 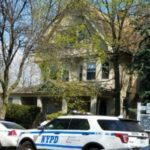 In the month of February, Shomrim collaborating with the NYPD made a total of 31 arrests. These arrests were made in Williamsburg, Boro Park, Rockaway Nassau, Flatbush, Crown Heights. Shomrim responds to any non medical emergencies. Shomrim does a lot more than just combat crime. Incredible city wide team.